My final few days playing Oreshika: Tainted Bloodlines were not exactly fun. I was repeating the same boss fights, running the same dungeons, eking every point that I could out of my clan’s current generation before their time was up and I would need to focus on their offspring instead. I was no longer interested in unraveling the intricacies of each map the game had generated for me, or imbuing the heirloom weapons crafted for the founder’s progeny with new powers, or freeing gods from earthly prisons so they could join the pantheon from which I was selecting my clan members’ mates. I was rushing through the illuminated paths and the multicolored hot spring puzzles that had captivated me a few days earlier, desperate to get as strong as possible, as fast as possible. As it turns out, that is the worst way to play this game. In Oreshika, you’re at the helm of a clan that’s been cursed with dramatically shortened lifespans and is unable to produce children with any mortal who doesn’t share their fate. Immortals are altogether exempt from this rule, however, and they’re glad to volunteer their genetic material to help strengthen your clan as long as you earn their favor first. The resulting gameplay loop is a little like Massive Chalice in that you are constantly replenishing your pool of fighters with their slightly more capable kids. Unless you’re a particularly bad matchmaker (or hit a patch of rough luck with unfavorable recessive genes) each generation is stronger than the last. Some of them may even inherit an immortal parent’s unique physical traits, like cat ears or horns. Yet as strong as your god-babies will one day be, you need to take the time to train them first. My current generation had been a hopelessly underpowered group of rag-tag newborns not so long ago. Months of turn-based grinding had produced a highly capable team: A hammer-wielding wrecker and sword-bearing fencer stood firm in the front row, while a martial artist and a priestess delivered focused attacks from the back. As they blew past their primes, and the signs of age (a cursed tattoo—what two-year old has wrinkles?) began to creep across their faces, I felt like I was grasping at my last chance. The last gleaming thread of hope. If that thread snapped it would be a while before we’d be in fighting shape again, and dear god I needed to finish this game already. I dreaded the thought of spending another in-game year grinding until the next generation would be able to hold their own… Or maybe even the generation after that. Then again, maybe we were ready. When I asked Kochin, the clan’s adorable human/weasel advisor, to suggest a course of action, she pressed me on towards the final encounter. Kochin had been my rock. The game encourages you to lean on your upbeat aide quite strongly in the beginning, and for good reason. In addition to making recommendations about what you should do next, she meticulously journals (and illustrates) what you’ve been up to, keeps a complete family tree, charts your clan’s strength over time, and offers tips and reminders about everything from basic combat to the odd little gimmicks of each dungeon type that you’ve encountered. She cheers you on in battle, consoles you after the loss of a clan member, and welcomes the new arrivals that replace them. In short she’s incredibly useful and brimming with personality. She’s a treasure, and she’d never steered me wrong before. Kochin seemed convinced that the team was capable, and helpfully suggested an array of boss-oriented supplies that I could bring along to increase my odds of success. I didn’t win. I lost, and jammed my left thumb down on the PS button and swiped the game shut with my right. I had performed this gesture countless times while playing Oreshika, more for the cathartic release it provided than to avoid any actual consequences in the game. Oreshika is actually very forgiving. Defeat doesn’t necessarily mean death. Most of the time, defeat just means “Come back in a couple months, kiddo.” Even so, I was frustrated. But if Kochin said I could do it, then I could. And I would. I would stubbornly keep replaying that fight until I did. Maybe this doesn’t sound fun, and at that point it really wasn’t. I was not having “fun”. But even when I was running into the same walls again and again I never felt the kind of impotent frustration that regularly leads me to take a break from a game and never come back. I like a challenge of course, but at the end of the day when a game makes me feel too incompetent to succeed I have a hard time finding the motivation to continue. I get mad at myself, and at the game in question. I start to hate it. Strangely enough, at no point did I ever hate Oreshika. That’s not all I struggled with. Oreshika: Tainted Bloodlines is actually the second game in the series, though it’s the first to be localized in English. When it was initially released in Japan last year, fans of the original were fairly unhappy with a key change that had been made. The story now revolved around a “main character” named Nueko, with your clan essentially caught in the crossfire between her and the game’s antagonist. 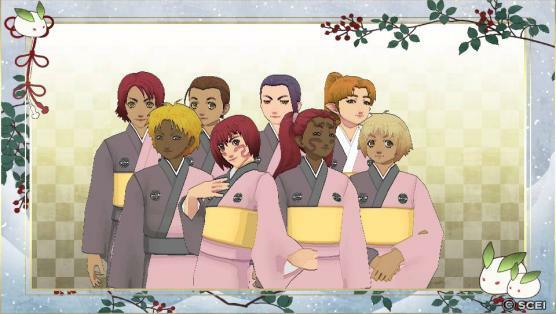 Even though I have never played the first Oreshika I can absolutely understand where these fans were coming from, because the very best parts of the game for me were often the ones when Nueko simply wasn’t around—when it felt like the game was actually about “us”. The brief, flickering lives of your clan members leave so many little impressions on you over the course of playing. They might remind you of the ancestor that had the same features or wielded the same weapon. If they are stricken with the plague you worry for their wellbeing, because their lives are so fragile and precious. When they die their final words may even make you tear up. But Nueko remains fundamentally the same person, half-dressed and rarely inspired to express anything but physical pain. You see her story play out in flashes of exposition, and seldom will you care. If Nueko wasn’t a strong fighter, her near constant presence in your party (which is mandatory for story progressing events) wouldn’t feel worthwhile. 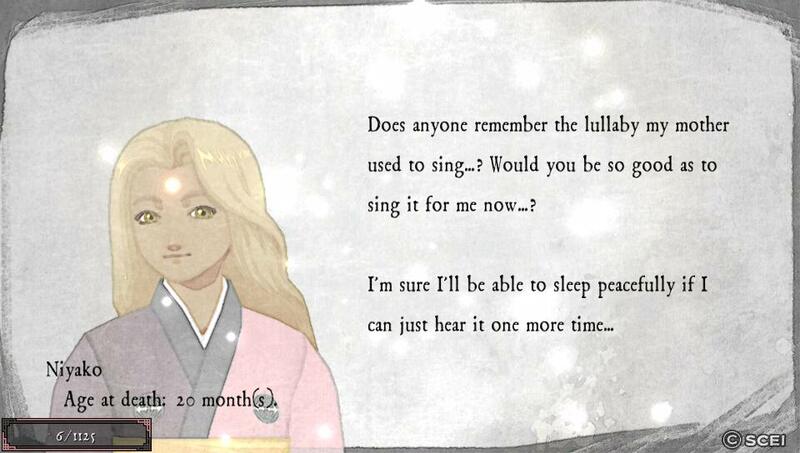 She’s just not terribly interesting, and her role undermines much of what Oreshika does to make the existence and evolution of your family feel meaningful. But Nueko is not the biggest problem I have with Oreshika. That honor falls to one of the first gods I was able to pair up with: Kujakuin Akemi, an unflattering caricature of a transgender woman who is included among a list of male gods. Kujakuin’s appearance and mannerisms will be particularly familiar to you if you’ve had a fair amount of exposure to Japanese media. This is not an uncommon trope in anime and the like, but that does not make it acceptable. The same goes for the “prissy” run assigned to dancer-class captains as they dart about the game’s dungeons. I rolled my eyes watching my female dancer perform this animation, but watching her son doing the same made me pause. If you’re ever unsure how to feel about when you come across something like this, ask yourself if whoever designed that moment expected you to laugh. It was the same feeling I had when I first saw Kujakuin—I knew that someone intended for players to laugh, both at the expense of the character and more significantly at the expense of the real people those tropes were created to mock. Even at my most frustrated, confused, irritated and even offended, there was always something to love about this game. There was the arresting visual design, with every environment, character and effect composed of soft watercolors and bold outlines. There was the music, a spirited mix of traditional and contemporary that never wore out its welcome. There was the ever expanding list of skills, each more impressively animated than the last. There was Kochin, wriggling around in time with the music during the Frenzy periods when all the monsters in a dungeon are celebrating. I hadn’t been chewing for a long time. I’d been tearing off great big chunks and gulping them down whole, and it hadn’t been an enjoyable experience. But after the credits rolled, and the post-game revealed itself, my relief to be done immediately changed into an eagerness to keep playing. Now that I’d finished the game there was no story to rush through, no progress points to beat my head against because of deadlines. Nueko’s specialized job class was unlocked for my clan, meaning that I would no longer need to call her down to benefit from her skills. I also now had the option to summon any god from the pantheon to join the clan on the battlefield as she had. 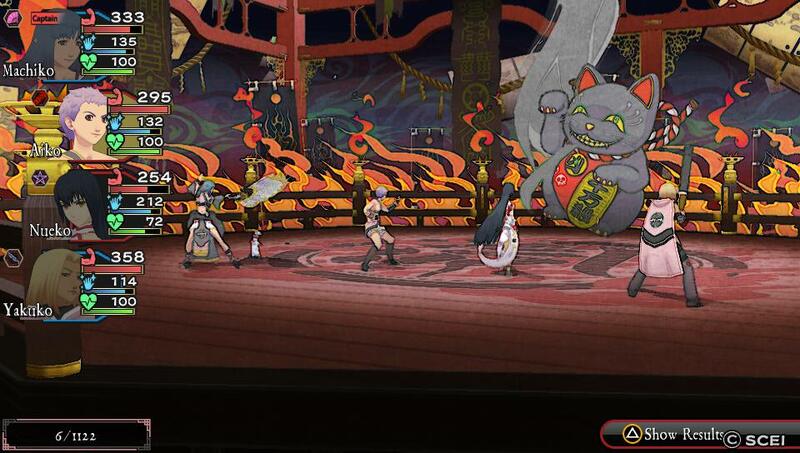 Better still, it felt like I could finally start to dig in to the subtler mechanics present in Oreshika. The heirlooms, the curses, the deification (or demonization) of my own family members, the passing down of powerful Secret Arts, the expansion of the town, the… Uh… Benefits and drawbacks of celestial inbreeding. I’m not sure I completed even one of the game’s random dungeons. If you’re playing on the game’s suggested difficulty setting it feels like you’ll barely scratch the surface of what it has to offer. Maybe that’s why it was such a strange relief when the game faded back in from the credits. I wanted to see how the twins would turn out after their training. I wanted to break the curse placed on the fan that the founder had commissioned for her son. I wanted to bring the deified gunner back to fight alongside his great-grandchildren. I wanted to find the heaven promised at the end of the Heptacolor Hot Springs. The very first thing I did was expand my clan’s house. I was finished, but I wanted to play more than ever.